Our guide to Austin will help you find the best frozen yogurt shops in Austin Texas. There's a mystique about Austin. Even if you've lived for years in this small town turned big city, the reasons why the city functions as it does, and why it seems so different from other U.S. cities, may not be readily apparent. High-tech industries have migrated to the area, making it Texas's answer to Silicon Valley. The city has also become an important filmmaking center. Austin is an extraordinarily open and welcoming place -- a city where you're not only allowed but expected to be yourself, in all your quirky glory. The people you encounter are likely to be laissez-faire and may even be newcomers themselves. For the moment, Austin retains a few vestiges of a small-town atmosphere -- but a quick scan of its fast-growing downtown skyline will tell you that its days as a sleepy college town are long gone. There are tons of great frozen yogurt shops in the city of Austin, our city guide will help you find the best frozen yogurt shops. You may have a hard time deciding what to do in Austin, but we make your decision easy. 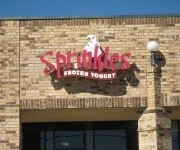 10700 Anderson Mill Rd, (512) 506-8736 - Frozen yogurt from Sprinkles is more than a delicious treat. It's an experience your friends and family will enjoy! 1201 Barbara Jordan Blvd, (512) 291-6145 - Yo So Cool is a frozen yogurt shop located in Austin TX. 13000 N I H 35, (512) 339-1333 - Self-Serve Frozen Yogurt In Austin Just Got....Sweeter! Come Build Your Perfect Cup At Fresh Cup Frozen Yogurt. 1601 Barton Springs Rd, 7828492 - yum yum frozen yogurt is a frozen yogurt shop located in Austin TX. 1701 W Parmer Ln, (512) 491-7138 - Tomunchi Frozen Yogurt is a frozen yogurt shop located in Austin TX. 2815 Guadalupe St, (512) 478-7768 - The Yogurt Spot is a frozen yogurt shop located in Austin TX. 3201 Bee Caves Rd - Fro Yo Yo is a frozen yogurt shop located in Austin TX. 3201 Bee Caves Rd, (512) 852-8528 - Froyoyo Austin's Frozen Yogurt is a frozen yogurt shop located in Austin TX. 360 Nueces St, (512) 473-8499 - Yummy Yo Frozen Yogurt is a frozen yogurt shop located in Austin TX. 500 N Lamar Blvd, (512) 474-7768 - The Yogurt Spot is a frozen yogurt shop located in Austin TX. 5523 Balcones Dr, (512) 323-0606 - BerryAustin is a frozen yogurt shop located in Austin TX. 241 W 2nd St, (512) 457-8278 - Tart Organic Frozen Yogurt is a ice cream / dessert located in Austin TX. There are plenty more frozen yogurt shops in Austin. See all frozen yogurt shops in Austin Texas.